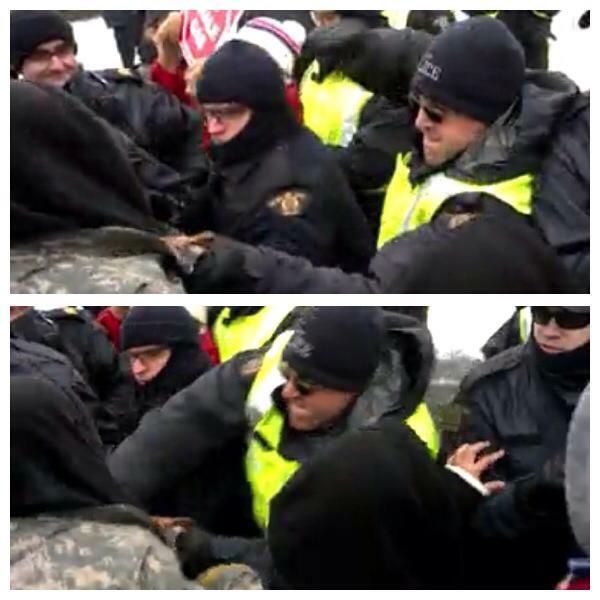 Some police “impartiality”; Mi’kmaq warriorPaul “Soda Pop” Francis assaulted by RCMP, Dec 2, 2013. The RCMP’s watchdog is looking into hundreds of complaints stemming from protests against fracking in New Brunswick late last year. The Mi’kmaq led the fight was against provincial government sanctioned shale gas exploration by SWN Resources Canada. Calls to the Commission for Public Complaints against the RCMP started to roll in as far back as July, 2013. And when the RCMP raided a Mi’kmaq Warrior camp on the morning of Oct. 17, it triggered violent clashes with police. By the end of the day, RCMP snipers in camouflage with rifles were hiding in the tall grass, 40 people were arrested and six police cars were set on fire. “There’s two sides to every story…their story was winning for the longest time,” said Malcolm Ward, from the Metepenagiag First Nation and was there that day in October. He hopes now that the investigation into the complaints is underway, a new understanding of what happened during the protests will come to light. Ward faced a variety of charges including obstruction and assault. He filed complaints that day over racist comments made by an officer who shouted: “Crown land belongs to the government, not to f—king natives.” Another RCMP member told Ward he was ‘trigger happy’ for him. Ward filed a complaint last year but hadn’t heard anything on for months. This week, two of the commission’s investigators paid him a visit. “Why did you it take so long? I needed you guys before my court dates,” Ward asked them. Ward faced numerous charges including obstruction and assaulting a police officer. He’s on two year’s probation and has to stay away from SWN equipment for a year. Improper arrest, excessive use of force, unreasonable detention and arrest without adequate grounds are just some of the complaints. Close to 20 people filed complaints against the RCMP, another 12 were anonymous. Tim Cogan, director of communications for the complaints commission, said the team usually deals with complaints within a year. But the sheer number of complaints tied to the fracking protests makes that deadline hard to meet. Investigators are getting a mixed reaction. RCMP relations have been strained with the Mi’kmaq in Elsipogtog. Now, a full year after that protest, investigators are on the ground conducting interviews with dozens of people. But Ward said many don’t trust any RCMP members, even retired officer now working for the commission. The Commission for Public Complaints Against the RCMP is an independent body. When the investigations are complete, a report will be released to the public and may include recommendations on disciplinary actions or policy changes. Then it’s up to the RCMP to follow them or not. Posted on October 16, 2014, in Oil & Gas, State Security Forces and tagged Commission for Public Complaints Against the RCMP, Elsipogtog, Indigenous resistance, Mi’kmaq, native blockades, New Brunswick shale gas protests, RCMP, RCMP and Natives, SWN Resources Canada. Bookmark the permalink. Leave a comment.